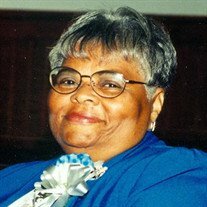 Obituary for Geraldine E. Tiff | E.F. Boyd & Son, Inc.
Geraldine Elizabeth (Bowles) Tiff, was born April 25, 1943 to Washington and Jean Bowles who preceded her in death. The joy of her life Steven Anthony Bowles was born on July 8, 1968. Geraldine married Manning Tiff in 1976. He preceded her in death. Geraldine confessed Christ at an early age at St. Paul UMC, she later affiliated with Allen Chapel in 1989, where she was active in the Nurses Guild, Hot Meals Ministry, member of the repass committee and anywhere else she was needed, mission, Thursday bible study. She leaves to mourn her passing her son Steven Sr. (Niccole), Grandchildren Asheley Mays (Jerome Jr.), Steven Bowles Jr. (Ada), Great Grandchildren Lance Hudson, Jaiden Mays, Kyrie Mays, Ja'Nae Bowles. One sister Diane, two brothers Douglas (Kitty), Michael (Krystal) and a host of nieces, nephews, aunts, uncles and cousins.